ISLAMABAD: Prime Minister Shahid Khaqan Abbasi, while noting the critical role of Afghanistan in the success of Turkmenistan-Afghanistan-Pakistan-India (TAPI) gas pipeline on Friday, said that the project was vital for the prosperity of the region. 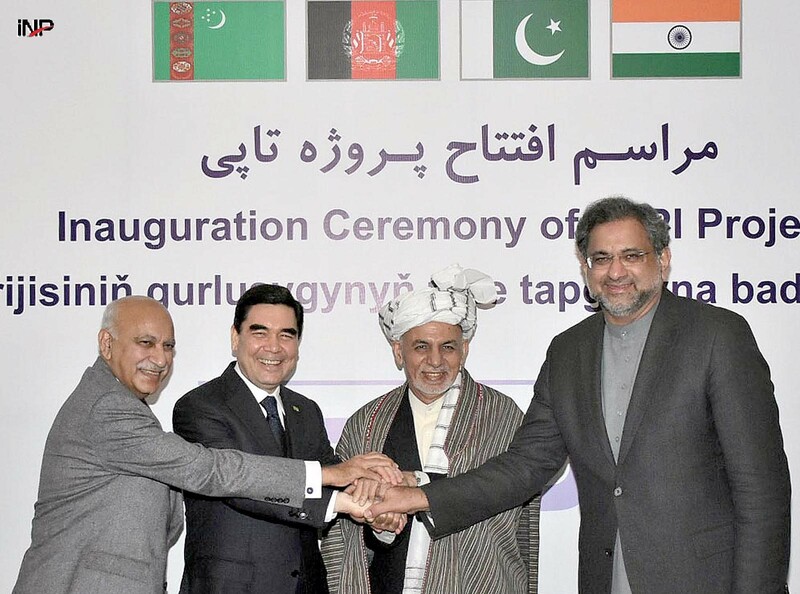 Abbasi said in Herat, Afghanistan during the second leg of the groundbreaking of the TAPI pipeline project’s link-up with roads, rail and fiber-optic network. Turkmenistan’s President Gurbanguly Berdimuhamedov, Afghan President Ashraf Ghani and Indian Minister of State for External Affairs M J Akbar also attended the event. Prime Minister Abbasi in his address said that the historic project would impact hundreds of millions of lives of the people of the region. He appreciated the vision of presidents of Afghanistan and Turkmenistan and congratulated the people of the countries involved in the project. He also thanked the leadership of the respective countries for bringing the people closer to each other by enhancing connectivity in the fields of energy, power, air, IT, railways and economic zones. He said that interdependence in the region was vital for sustainable peace. The prime minister, appreciating the role of Afghanistan in the ambitious project, said TAPI could not happen without Afghanistan. He expressed gratitude to Afghanistan President Ashraf Ghani for ensuring the success of the project and for bringing the people of the region closer. He was optimistic that the project would strengthen historical ties and reiterated Pakistan’s full commitment to peace in Afghanistan and assured that its commitment would remain unchanged. The prime minister said that no country was more interested in peace and stability in Afghanistan than Pakistan. He told the international gathering that Afghanistan would not find any better partner in its struggle for peace than Pakistan. “Your success is our success. Your development is our development. Peace in Afghanistan is like peace in Pakistan,” he said. Earlier, PM Abbasi and Afghan President Ashraf Ghani launched the first leg of 1,814 kilometer (1,130 mile) gas pipeline on Friday that would feed Turkmenistan’s gas to Afghanistan, as well as Pakistan and eventually to India. Heavy security would guard the pipeline construction through war-weary Afghanistan, said Jelani Farhad, spokesman for the Herat provincial governor’s office. The long-awaited pipeline project, known by the acronym TAPI, would take two years to complete, but it had been in the planning for several years. The United States advocated the pipeline as a source of much-needed gas to all three countries over an alternative pipeline, which was also being negotiated, bringing gas from Iran through Pakistan and into India. The TAPI pipeline is a rare show of cooperation between often hostile neighbours Pakistan and India as well as the often contentious neighbours Pakistan and Afghanistan. Abbasi attended the ceremonies along with a representative of the Indian government. Security had been a concern leading up to the inauguration but Farhad said Afghanistan had devised a detailed security plan to protect the pipeline construction as well as the pipeline. Taliban spokesman Zabihullah Mujahid told the AP in a telephone interview that the religious movement was ready to guarantee the pipeline’s security. “We are ready to protect TAPI. It is good and important and vital for the economy of Afghanistan,” he said, noting the pipeline had been under consideration during the Taliban rule that ended in 2001. Ghani told the gathering that the pipeline was a message to the future generations. “We hope our next generation will see this pipeline as the foundation of a joint position in our region which is aimed at improving our economy, providing jobs and increasing our security, all in our fight against extremists,” he said. The pipeline would have a capacity to carry 33 billion cubic meters (43 billion cubic yards) of gas from Turkmenistan to Pakistan and India through Afghanistan’s Herat, Farah, Helmand and Nimroz provinces. Addressing the gathering, Pakistani Prime Minister Shahid Abbasi said that the TAPI gas pipeline project was a historical opportunity to reestablish regional ties. “I assure you of Pakistan’s full commitment to the project,” he told the attendees of the inauguration ceremony. Abbasi had earlier met the president of Turkmenistan and stressed on the need for the two countries to bolster their military and defence cooperation. The premier was received by Rasit Meredow, the Deputy Chairman of Cabinet of Ministers of Turkmenistan, at the Mary International Airport, as per a press release issued by the Prime Minister House. During his meeting with President Gurbanguly Berdimuhamedow, the prime minister highlighted the importance of the TAPI gas pipeline project, especially with regard to Pakistan’s rising energy needs. Abbasi and Berdimuhamedow talked matters of mutual interest, the security situation in the Central and South Asian region, as well other issues pertaining to the TAPI gas pipeline project. Further, Abbasi underscored that the China-Pakistan Economic Corridor (CPEC) was a significant part of the One Belt One Road Initiative. The premier went on to offer Turkmenistan assistance in its defence requirements from Pakistan. PM Abbasi returned to Pakistan on Friday evening after his two-day visit to Turkmenistan and Afghanistan.